Letterbox baking There are 90 products. 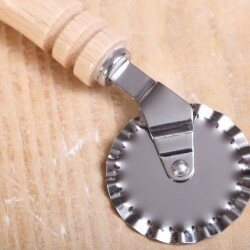 Pastry and pasta cutter wheel made of stainless steel with wavy edge and beech wood handle. 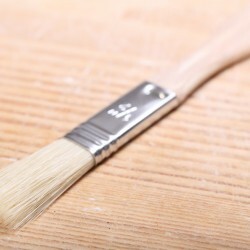 Pastry brush with beechwood handle and natural bristles, 1.2 cm / 0.5 Inch. 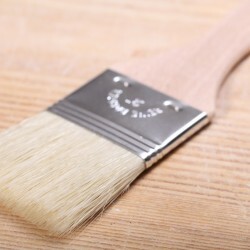 Pastry brush with beechwood handle and natural bristles, 4 cm / 1.5 inches. Back in stock. 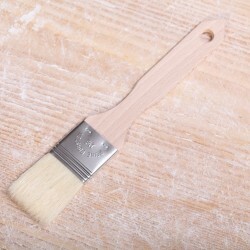 Pastry brush with beechwood handle and natural bristles, 5 cm / 2 inches. 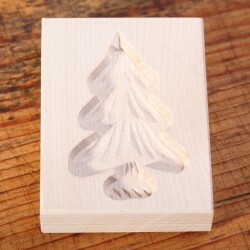 Cute kraftpaper stickers to present your homemade baking gifts. 12 stickers per set. 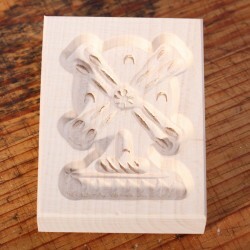 Ø 3.5 cm / 1.4 inch. 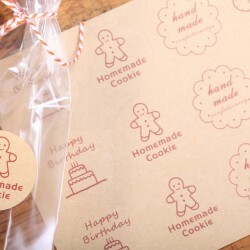 Cute 'Hand Made' kraftpaper stickers to present your homemade baking gifts. 20 stickers per set. 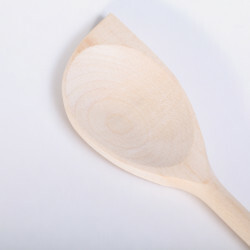 We think this is the ideal sturdy wooden spoon. 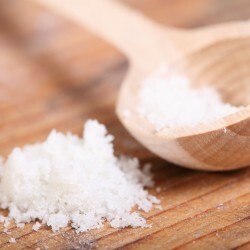 The pointy tip reaches the corners of your pots and pans too. 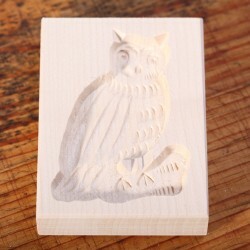 European beech wood. L 30 cm x W 6 cm. 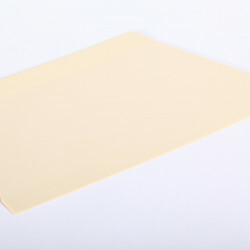 Flexible & sturdy scrapers to lift, cut, move, stretch, fold and shape your dough. Available in three sizes. 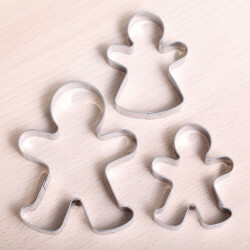 Cookie cutter 'Gingerbread': large gingerbread man (9cm) and a gingerbread man and women (both 6 cm). Made from stainless steel. Set of 3. 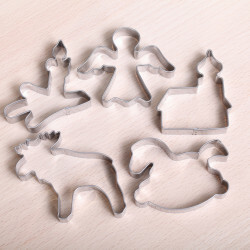 Cookie cutter set 'Christmas Tradition'. Made of stainless steel. Set of 5. 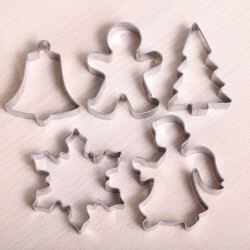 Cookie cutter set 'Winter Wonder'. Made of stainless steel. Set of 5. 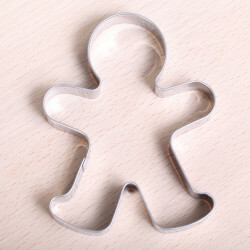 Cookie cutter set 'train'. 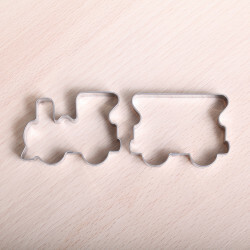 This two piece cutter set, made of high quality stainless steel, has a locomotive and wagon, they measure 5.5 cm each. 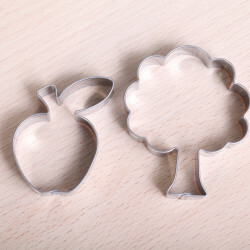 Cookie cutter 'Apple & Tree'. This set is made of high quality stainless steel, measures 5 and 6 cm. 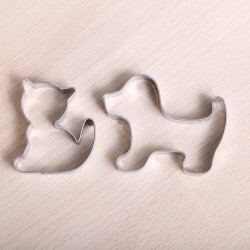 Cookie cutter set 'Puppy & Kitten'. 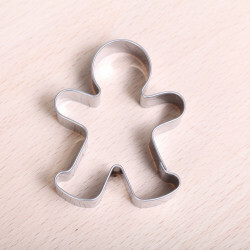 This two piece cutter set, made of high quality stainless steel, has a little dog and kitten, they measure 5.5 cm each. 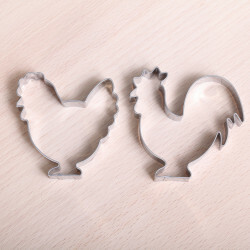 Cookie cutter set 'Rooster & Hen'. 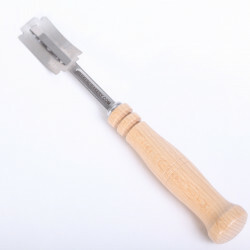 This two piece cutter set is made of high quality stainless they are both 6 cm in height. 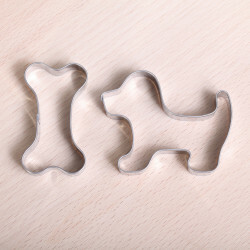 Cookie cutter set 'Puppy & Bone'. 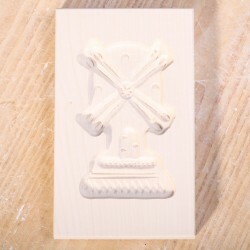 This two piece cutter set, made of high quality stainless steel, has a little dog and bone, they measure 5.5 cm each. 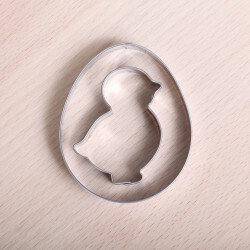 Cookie cutter set 'Chick & Egg'. 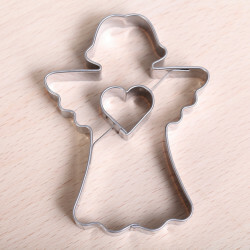 This two piece cutter set, made of high quality stainless steel, has a little chick measuring 5 cm and an egg, 7 cm in length. 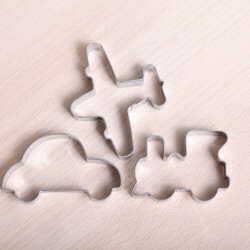 Cookie cutter set 'Train, plane, automobile'. This three piece cutter set, made of high quality stainless steel, has a locomotive, airplane and car. 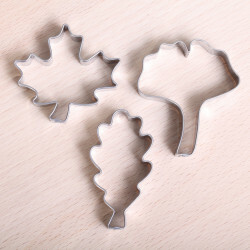 Cookie cutter set 'Autumn Leaves'. Made of stainless steel. Set of 3. 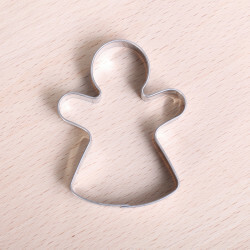 Cookie cutter set 'Autumn'. Made of stainless steel. Set of 5.